Today we drove down to San Juan Capistrano to tour the Los Rios Historic District, which was the original settlement for the workers building the Mission San Juan Capistrano. It's a funky, eclectic neighborhood that's still occupied as a residential and business district. For pictures, click here. Today's adventure was to see the recently opened Palm Springs Art Museum Architecture and Design Center. The A+D Center is housed in a recently restored building that was originally designed in 1961 by E. Stewart Williams for a local bank. 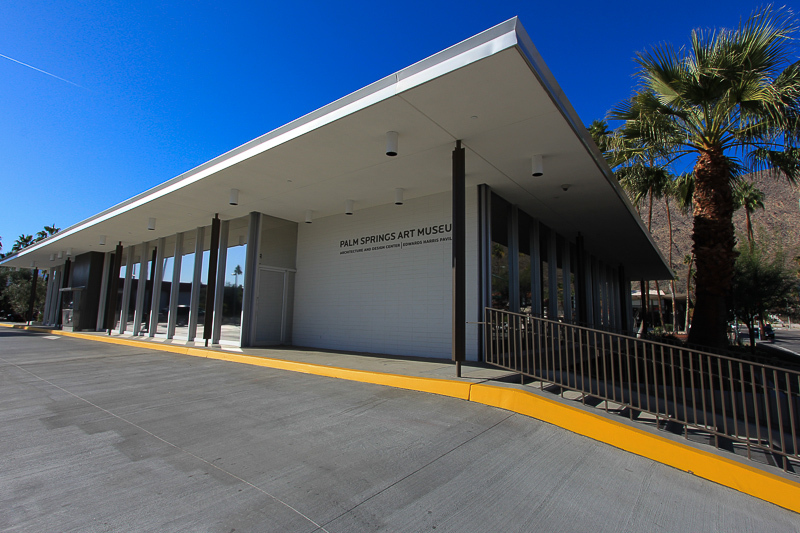 Williams was one of the most important architects of the Desert Modern style, developed in and around Palm Springs in the middle of the 20th century, and the building is one of the prime examples of this movement. The current exhibition, "An Eloquent Modernist: E. Stewart Williams, Architect" is the center's first show. Unfortunately, no photography was permitted inside the building. Today we drove to Hacienda Heights, CA to see a beautiful Buddhist monastery, called the Hsi Lai Temple. It was a wonderful experience. For pictures, click here. Thanksgiving Day 2014 in SoCal and the weather forecast is for sunny skies with a high temperature of 87°. It's raining here in SoCal! This is the first time in 2014 that I have not run in the morning because of rain. I almost made it through the whole year without a rain day. Talk about a drought, unbelievable! Well today we took a real plunge into a very big Los Angeles tourist destination. 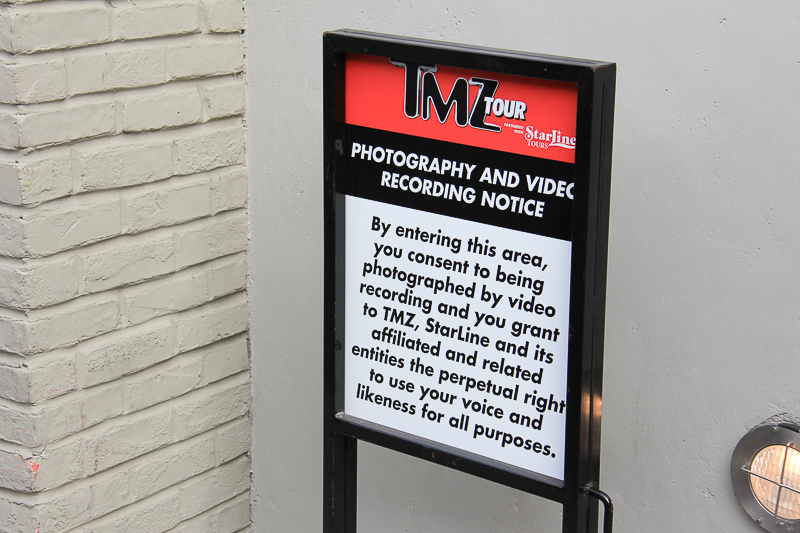 We went for the TMZ Hollywood Tour to "see the hottest spots in Hollywood, Beverly Hills and the Sunset Strip, where celebrities go to play." It was fun, although we didn't see any celebrities. 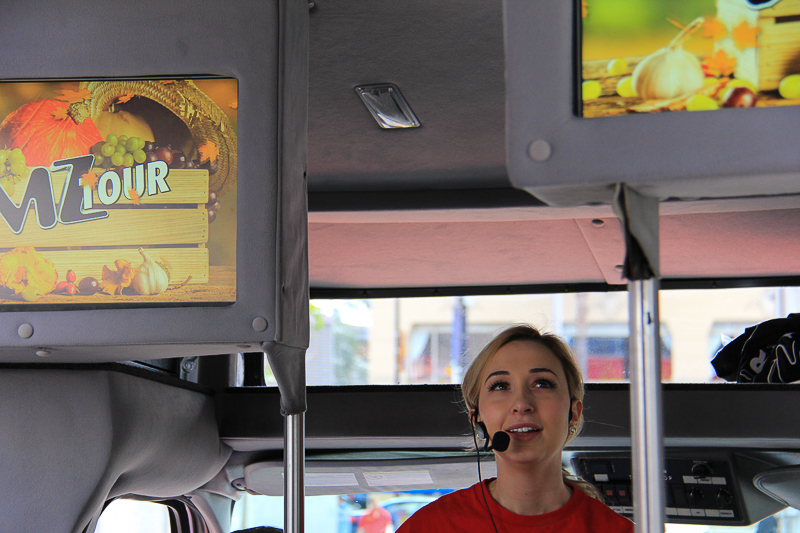 Here's our tour guide, Lexi, and the TMZ disclaimer welcoming all guests. We had a great breakfast at Mel's Diner of bacon and eggs, crispy hash brown potatoes and sourdough toast. Today we had a full schedule of activities in Los Angeles. First we went into the Flower District to pick up some wrapping paper and bows for Christmas presents. Next we had brunch at Philippe's. You have to love their "double dip" beef French Dip sandwiches. 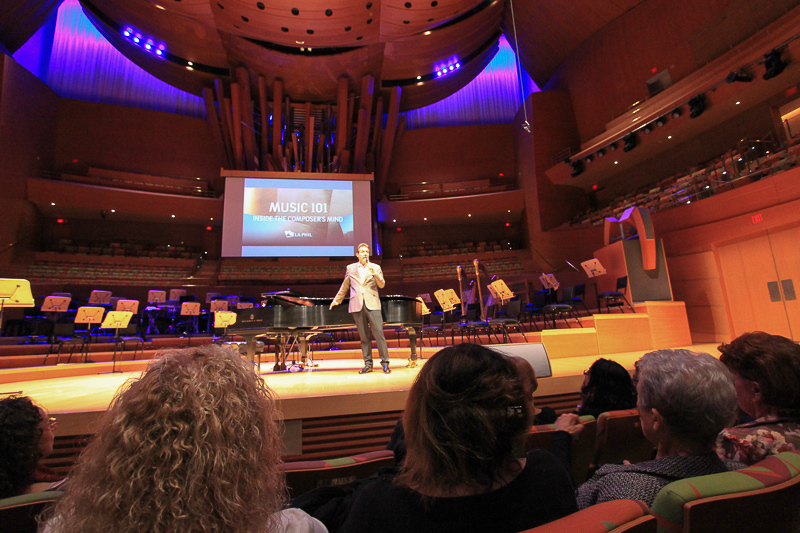 That business being done, it was time to go to the place that was the real reason for the trip, attending a lecture at the Disney Concert Hall given by Alan Chapman of Classical KUSC (91.5 FM), Los Angeles. 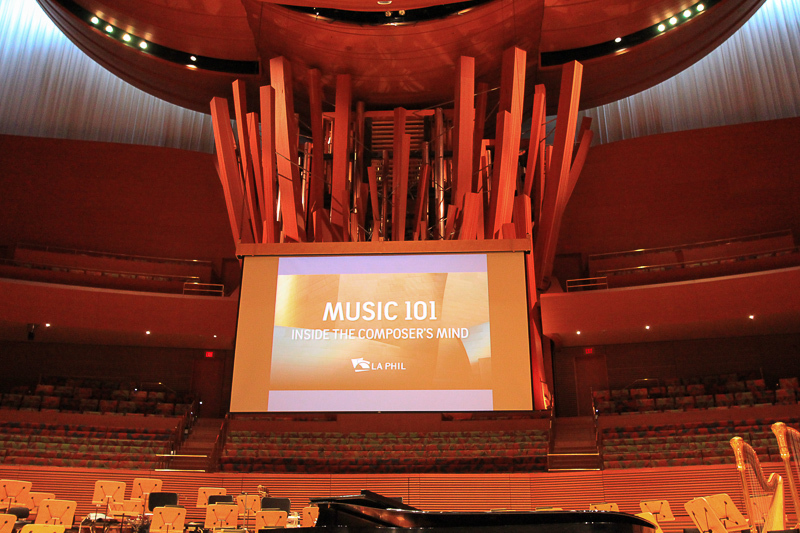 The lecture was called "LA Phil Music 101" and its purpose was to "learn about some basics of musical structure while exploring the conventions composers inherit and either follow, modify, or defy." Alan was great in that the lecture was informative and he was very entertaining. 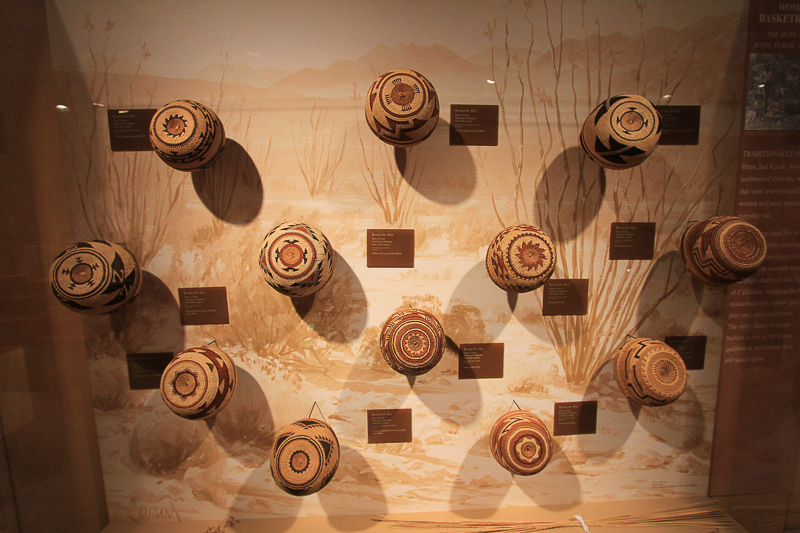 The Bowers Museum in Santa Ana has some of the most unusual exhibits that we've found in Southern California. Today we saw China's Lost Civilization: The Mystery of Sanxingdui that has over 120 artifacts of the ancient Sanxingdui culture on loan from the government of China. Besides some speculation from experts, little is known about the Sanxingdui. For pictures, click here. Today we visited the Palm Springs Art Museum for the first time and we both fell in love with it. Generally speaking neither one of us much appreciate modern art, but this museum changed our minds. For pictures, click here. Happy Halloween! After touring the Walt Disney Concert Hall earlier this year, we both wanted to complete the adventure by seeing a performance there, and today we did. Esa-Pekka Salonen was the conductor for both Mozart's Piano Concerto No. 20 in D minor, K.466 and Beethoven's Symphony No. 3 in E-flat major, Op. 55 ("Eroica"). The pianist for the Mozart Concerto was Jeremy Denk. The sound was wonderful, and so was the lunch at Philippe's. We both had a beef "double-dipped" French dip sandwich with a side of potato salad for Judy and New England clam chowder for me, washed down with some fresh squeezed lemonade. Yum! Today we drove out to the Mojave desert for a tour of the Marine base in Twentynine Palms, CA. For pictures, click here. Today we visited a new museum in the desert, the Palm Springs Art Museum in Palm Desert. Their current exhibition is A Grand Adventure: American Art of the West. For pictures, click here. We've heard about the canals in Venice, CA but haven't gotten around to seeing them until today. For pictures, click here. 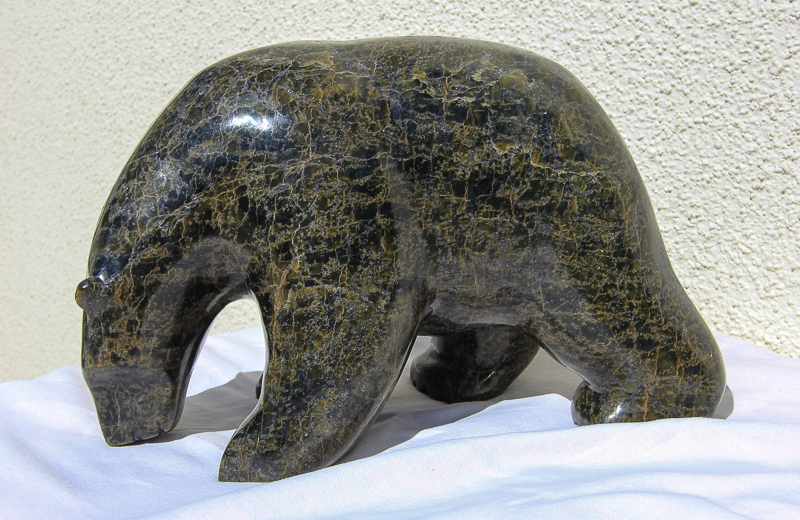 Today we received our new bear sculpted by Inuit artist Tony Ohotaq. 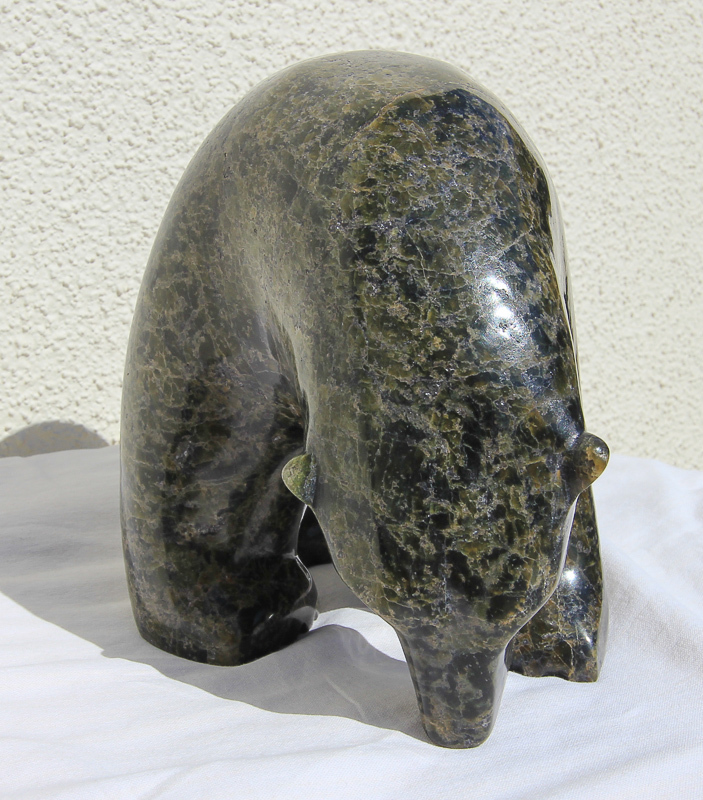 We purchased it at the Inuit Gallery of Vancouver while in Vancouver last month. We love him! We had a very interesting day today at the Mission San Antonio de Pala in Pala, CA. This Asistencia is located within the reservation of the Pala Band of Mission Indians and its church, school and community facilities are all in active use. For pictures, click here. We went to Vancouver, British Columbia for three days and somehow managed to escape the rain. It was a wonderfully exhausting trip, for pictures, click here. To celebrate Judy's big birthday today we had brunch at the Grand Oak Steakhouse & Bar in Cherry Valley, CA. The chef, Stefan Weck, has quite a flair for food and its presentation. We both had the same menu choices today to go with our coffee and Bacon Bloody Mary's. The first course was a delicious organic roasted tomato soup followed by his Eggs Benedict; poached eggs and Canadian bacon served on a house-made English muffin with Hollandaise sauce. The muffin was excellent and the eggs were perfectly poached. Thank you, Chef Stefan! Today we were in Los Angeles to visit the Cathedral of Our Lady of the Angels. For pictures of this stunning place, click here. Supposedly it's the "last" weekend of summer, except in SoCal where we'll probably have at least 8-10 more "last" weekends before fall sets in. In any event, we had two beautifully steamed Maine lobsters for lunch at the pool, with a bottle of Mezzacorona Pinot Grigio for a chaser. We read the Los Angeles Times after the meal and then took a couple of dips in the pool. It's currently 88° here under a cloudless blue sky. What's not to love? Today we headed east to see a small museum in Cherry Valley, CA called the Edward-Dean Museum & Gardens. We ended up being doubly surprised because the museum was fabulous and the restaurant that we went to afterwards was outstanding. For pictures, click here. Today we headed to Griffith Park in Los Angeles to take a bus tour to view the Hollywood Sign. The Los Angeles Department of Recreation and Parks operates the shuttle service between the Greek Theater, the Hollywood Sign Viewing Area and Griffith Observatory. For pictures, click here. We went to kind of an offbeat museum today in Santa Fe Springs, CA called the Hathaway Ranch and Oil Museum. It was fascinating! For pictures, click here. Today we went into the San Jacinto Mountains to see our third fire lookout on Black Mountain. It was a long, bumpy ride in over a dirt road in terrible condition due to recent storms. For pictures, click here. Today we went to Pasadena to tour the Gamble House, built in 1908, which is an internationally recognized masterpiece of the turn-of-the-century Arts and Crafts movement in America. For pictures, click here. 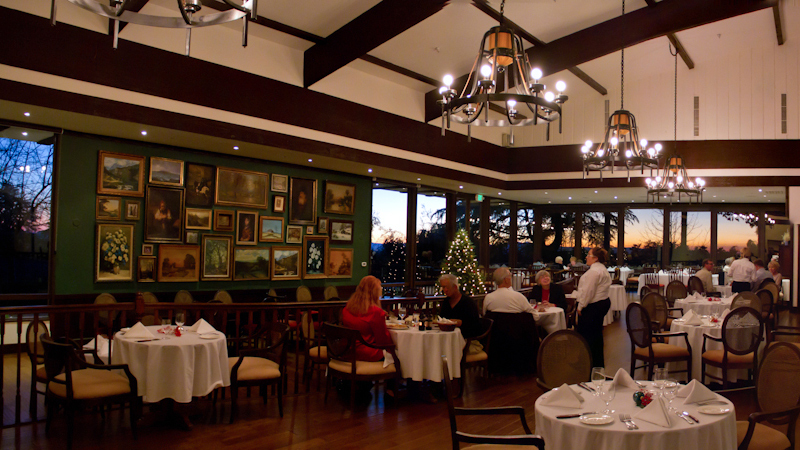 We had recently bought a Travelzoo deal for the Circa 55 Restaurant located in the Beverly Hills Hilton Hotel. The deal was for a Sunday brunch and today we cashed it in. The brunch itself was good, but not great, however, the restaurant itself was worth the trip. The name "Circa 55" was chosen for the year the hotel was founded and the vibe was definitely 1950's rat pack cool. The furniture was in the mid-century style. The restaurant adjoins the hotel's pool. The music was very cool since it all dated to the 1950's and early 1960's. When we walked in, the "Beep Beep" song was playing. All of the waiters had dark hair, dark suits, were well groomed and looked like extras from a 1950's Las Vegas movie set. It was laid back, cool and hip. We loved it. Today we went to Wilmington, CA to visit and tour the Drum Barracks Civil War Museum. It is the last remaining original Civil War era military facility in Southern California. For pictures, click here. During July the Bowers Museum Store has a 30% off sale for members only, so we went there today to check it out. We always like the greeting cards that they carry and we weren't disappointed today. They also had several small special exhibits that we took in, so the trip was a success. These are basket hats from the "Early Californians" exhibit. We spent a beautiful day in Los Angeles today, taking a tour of the iconic Union Station. Since it opened in 1939, it is now celebrating its 75th year of operation. For pictures of this gorgeous building, click here. The swarm of earthquakes continues! Between 3:39 PM on Thursday July 3rd and this morning, there have been 173 earthquakes recorded by the Southern California Earthquake Data Center. I emailed them this morning, hoping that they may shed some light on what's going on with all of these earthquakes. Every day I check the Southern California Earthquake Data Center to record the seismic activity here in Redlands. I was shocked to see that there were 87 recorded earthquakes here in the last two days! It's going to be several hours before I transfer this data to my earthquake page. Five years ago today we began our new life in California. As our plane was landing at LAX on June 25, 2009, a flight attendant announced that Michael Jackson had died and we were soon in a rented car heading for our temporary quarters in Redlands. 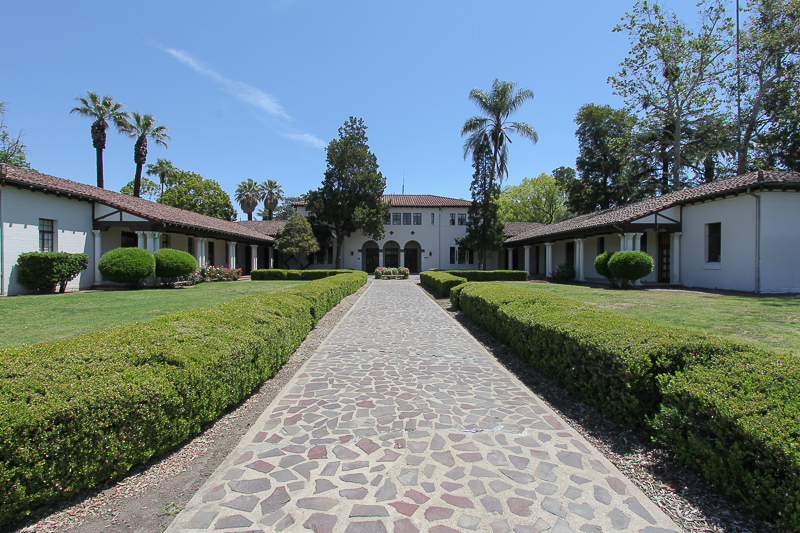 To mark this anniversary, today we visited the Workman and Temple Family Homestead Museum in the City of Industry, CA. For pictures, click here. We spent the day in Hollywood today visiting the beautiful Hollywood Forever Cemetery and then we had lunch at the iconic Musso & Frank Grill. For pictures, click here. 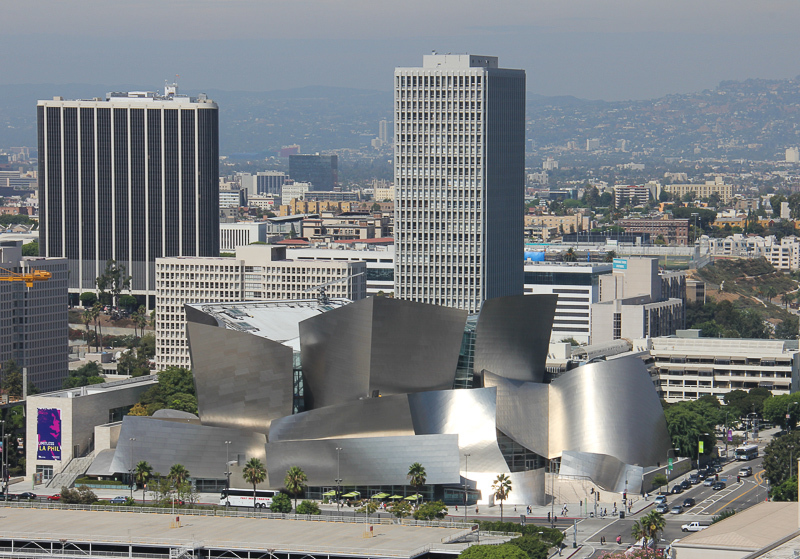 Today we were in downtown Los Angeles to tour the Walt Disney Concert Hall. What a building! For pictures, click here. Today we took in the "Seabiscuit Tour" at the Santa Anita Race Track. It was very informative and it certainly goes behind the scenes of a thoroughbred track. For pictures, click here. We had a great adventure today up in the San Bernardino National Forest. Our first stop was at the Strawberry Peak Fire Lookout and the second stop was at the Heaps Peak Helitack. Helitack refers to "helicopter-delivered fire resources." For pictures, click here. 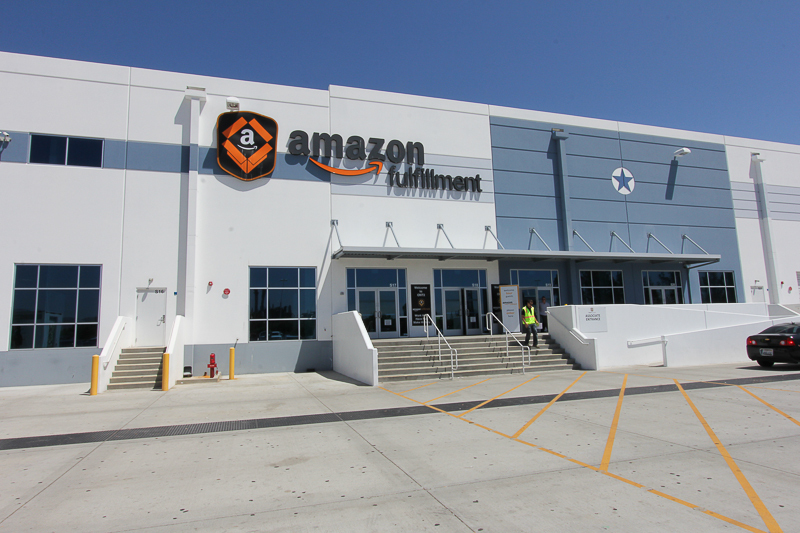 Amazon opened one of their "Fulfillment Centers" in San Bernardino about one year ago and beginning last month, they started offering public tours of the facility. The tour lasted an hour and was fascinating. Photography wasn't allowed inside, but even with pictures it would be hard to convey the immensity of this operation. At any one time there are about 46 million pieces of merchandise tagged and stored here. The high tech conveyor operations were mind boggling. 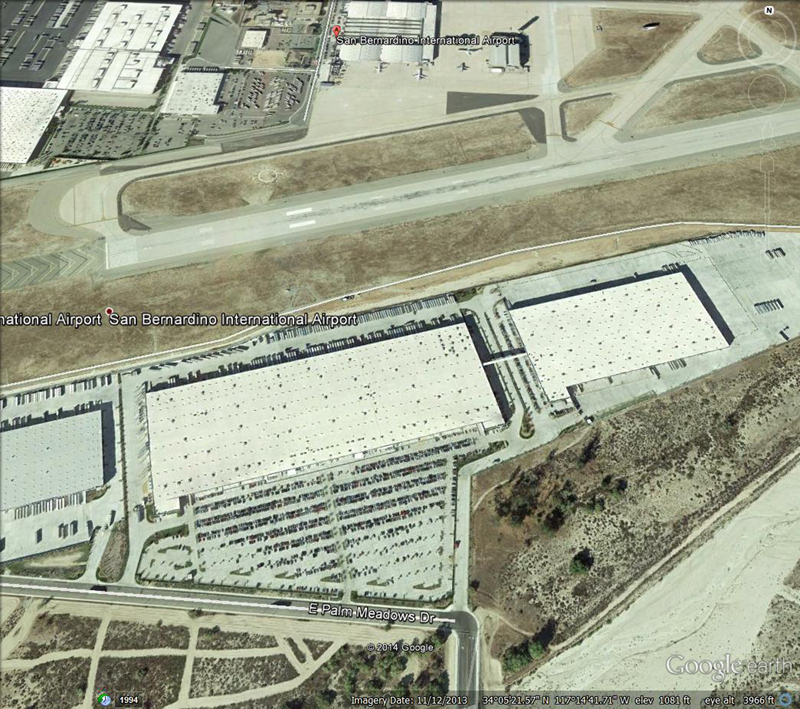 We toured the 900,000 square foot building in the center of the below Google Earth photo. They also operate the 500,000 square foot building on the right. It's a dazzling operation! After a night to think about Bello's problems, we both did some research and came to the conclusion that treating his condition was going to be impossible since he wouldn't cooperate with us giving him mediation. Plus, any treatment we could give him would just delay the inevitable. Dr. Dusenberry agreed with us whole heartedly and Bello was euthanized this afternoon. 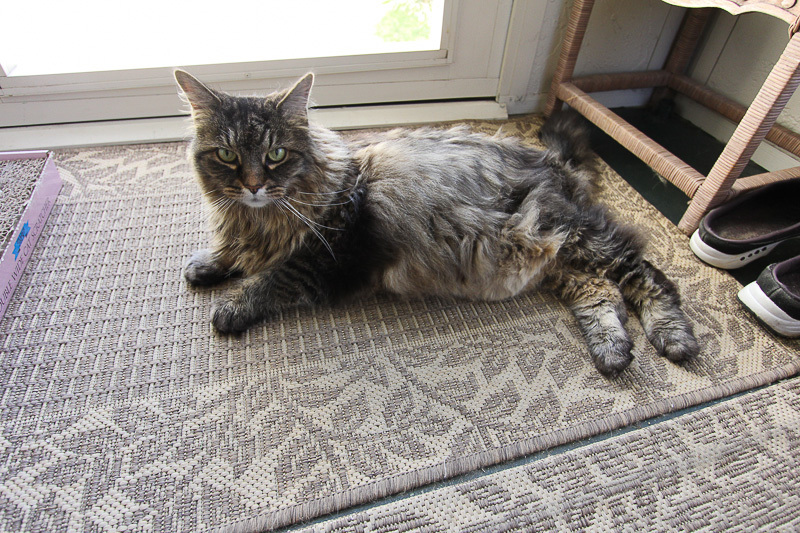 He had a wonderful life and we had a wonderful kitty for close to thirteen years. This is the last picture I took of Bello on May 18, 2014. Cats can't talk, but they can speak to you with their eyes. Rest in peace, big boy, we love you. We got a call from Dr. Sueda of California Veterinary Specialists in the late afternoon about Bello's status. The diagnosis is that he has evidence of small cell lymphoma in his gastrointestinal tract. This condition is treatable and we now have an appointment with Dr. Fitzpatrick, their resident oncologist, for Wednesday June 4th. We plan to speak with our local vet, Dr. Dusenberry, tomorrow to gauge his feelings on how Bello's quality of life will be during cancer treatment. These are very tough times for all us, since Dante knows that something is not right with his brother. For further information about feline gastrointestinal lymphoma, click here. We took a relatively short ride today to visit the Pío Pico State Historic Park in Whittier, CA. 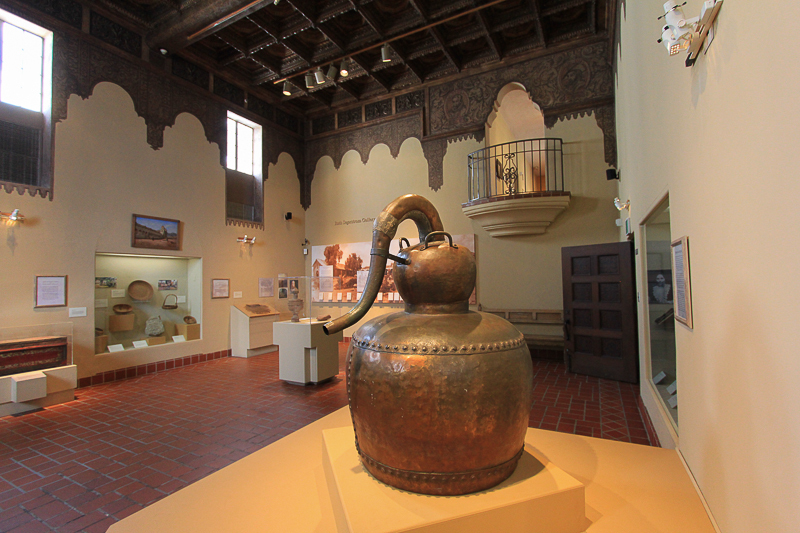 This beautifully restored adobe was the home to the last Mexican governor of Alta California. For pictures, click here. Today we attended our nephew Brandon's graduation ceremonies at California State University, Long Beach. Brandon and his girlfriend Nora Hall both received their Bachelor of Arts degrees for Theater Arts. For pictures, click here. Today we spent a very long day in Ontario, CA at the California Veterinary Specialists with our Bello. Bello has been sick for over a month with frequent vomiting and a general listlessness. We've been to our local vet twice and the blood work indicated a high level of calcium, which can mean the presence of a cancerous tumor. It was a very anxious day for us since we both thought the CVS doctors would recommend putting him down. However, he’s now home and on medication. The preliminary diagnosis is a type of Crohn’s disease found in cats. We left with him at 8:30 AM yesterday morning and didn’t get back until a little after 7:00 PM last night. They took biopsies and are doing additional blood work, which results will take about a week. The hospital staff is very professional and caring. They’re also $2,200 richer from his visit. He had an ultrasound and an endoscopy, where he was completely put out and they shoved a scope down his throat and right into his stomach. The strange thing is the doctors really didn’t see anything unusual with him at all. All his organs looked normal and there wasn’t any evidence of any kind of tumors anywhere. Well, at least we know that we’ve done everything than we can do for him. We’re supposed to be giving him four separate medications per day, but we’ll be lucky to get him to take two. He seems marginally better since we've returned and his vomiting has stopped. Today we had an interesting adventure here in Redlands. We went for a three hour bus tour of the Mill Creek Zanja sponsored by the Redlands Area Historical Society. Nothing on the tour was very photogenic since a Zanja is simply an irrigation ditch. However, because the ditch was constructed in 1819 mainly by Native Americans under Spanish Franciscan missionary supervision, it is the oldest artifact here in San Bernardino County. Remnants of the Zanja are visible for nearly seven miles of its original course of twelve miles. Today we drove up to Big Bear in the San Bernardino Mountains to see an old gold prospecting area. We were also lucky enough to get a close up view of the Big Bear Solar Observatory on Big Bear Lake. For pictures, click here. I visited my sister Nancy this week in South Carolina. We had a great time together and we were able to take in some sights in and around Charlotte, NC. For some pictures, click here. Unfortunately I had my worst travel day ever on my way back to the West Coast, but even with all the aggravation, I made it. Today we did a little shopping at Victoria Gardens in Rancho Cucamonga and saw the smoke from the Etiwanda fire that is still burning. Before leaving we had lunch at Crêpes de Paris. We both had their French Onion Soup that was okay, but not great. However the crêpes were delicious. Judy had the curry crêpe with chicken, sweet red pepper and mozzarella cheese in a curry cream sauce. I had the ham and cheese crêpe with a honey mustard sauce. We were both very satisfied with our selections. After lunch we headed over to Ontario to visit the Ontario Museum of History and Art. The purpose of the Museum is to promote knowledge and understanding of the history, art, and cultural traditions of the greater Ontario area and their collection of artifacts is extensive. After the city was incorporated in 1891, the present museum was originally constructed as the first City Hall of Ontario, CA. About one month ago the LA Times sponsored a contest for members promoting the Newport Beach Film Festival. I entered it and was lucky enough to win a third place prize of two free tickets for any one film. Luckily we chose to see "Cas and Dylan," directed by Jason Priestley and starring Richard Dreyfuss and Tatiana Maslany. It was wonderful! We had brunch at Norm's before seeing the movie at the Island Cinemas in the Fashion Island shopping center. Today brought us to Long Beach, CA to visit the Museum of Latin American Art. 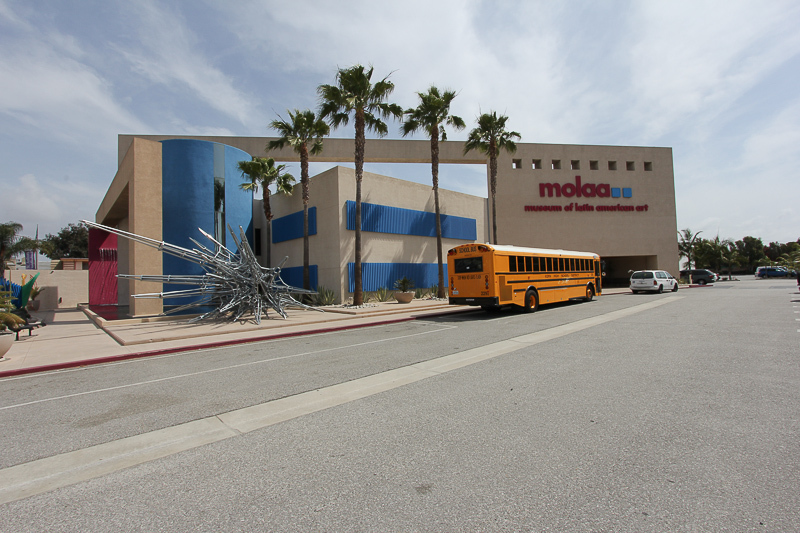 MOLAA is the only museum in the United States dedicated to modern and contemporary Latin American art. Currently on exhibit are some of the personal photographs of Frida Kahlo. "Frida Kahlo, Her Photos" is a selection of 200 images from the 6,500 which are part of the Blue House (La Casa Azul) archive in Mexico City. Frida was a Mexican painter who is best known for her self-portraits and for her volatile marriage with the famous Mexican artist Diego Rivera. Unfortunately, taking pictures of the pictures wasn't allowed, but we had a nice lunch at Cafe Piccolo. Today we drove over to San Fernando to visit the expansive Mission San Fernando Rey de España. When we started touring around, we couldn't believe how large it is and how they were able to save as many artifacts that they did. This is certainly one of the best missions that we've seen. Bob Hope and his wife Dolores are entombed here in a special memorial park. For pictures, click here. Today we had a nice lunch at Stefano's in Yorba Linda with Bryan and Thereasa. For paninis, we had The Romeo, a Caprese and Uncle Carmine's Big Italy and all were delicious. Thereasa was the good one in the bunch and only had a Caprese salad. Afterwards we drove a couple of blocks to the Nixon Presidential Library. Judy and I had been here before on July 18, 2012, but it was the first visit for Bryan and Thereasa. For pictures from our previous trip, click here. We had two adventures today since both places are fairly close to each other. The first was to see the new Huell Howser exhibit at Chapman University. Huell left most everything he owned to the University, especially all of his videotaped archives. 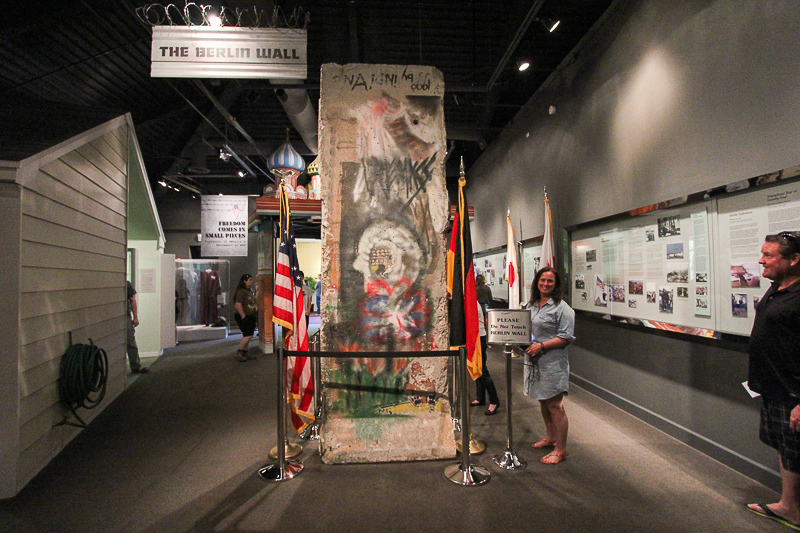 Seeing this exhibit was our 100th adventure in California, which is most appropriate. For pictures, click here. 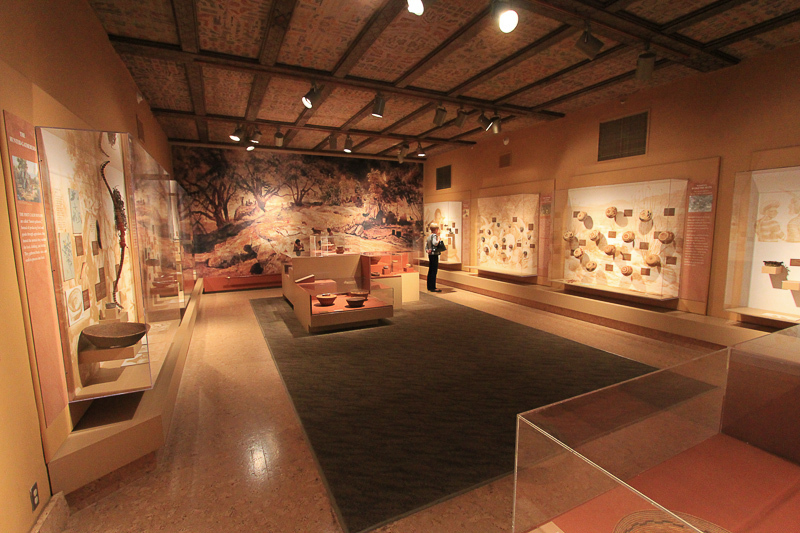 Our second adventure was only a few miles away at the Bowers Museum in Santa Ana. Their new exhibit is called "Soulful Creatures: Animal Mummies in Ancient Egypt." The mummies weren't all that pretty to look at, but the other artifacts in the exhibit were beautiful. For pictures of the Bowers adventure, click here. Today we had a great adventure learning about the newspaper business. We toured both the editorial offices and the printing plant used by the Los Angeles Times. We'll never read the LA Times in the same way again. For pictures, click here. Today we went back to the Sunnylands Estate in Rancho Mirage to take their ninety minute tour of the home and the grounds. The most impressive aspect of the tour was the fact that this estate was simply someone's private home. For some pictures of this gorgeous property, click here. 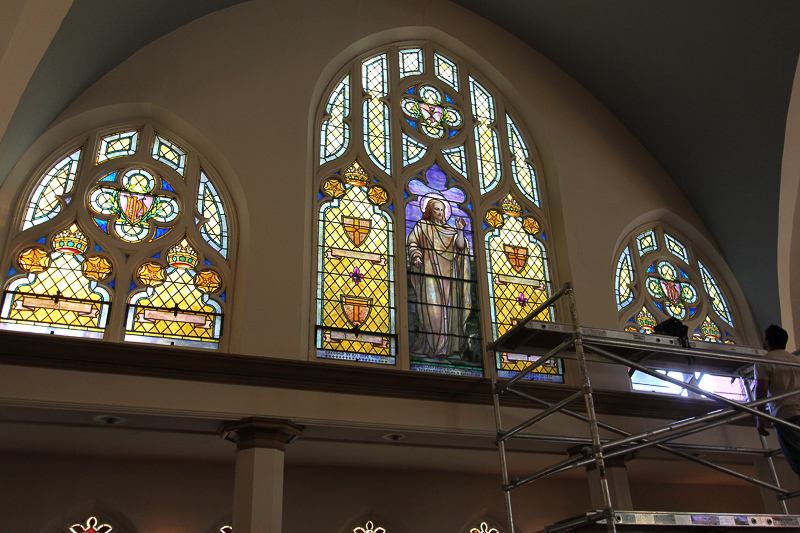 We read an article in today's Redlands Daily Facts that mentioned the stained glass windows, which were recently restored, are now being re-installed in the First Congregational Church. To the surprise of the congregation, it was discovered that six of the 114-year-old windows are marked: “Tiffany Glass and Decorating Company, New York.” The Tiffany windows, which are titled “The Resurrection,” face out onto Cajon Street. I just finished a wonderful biography of Edward Curtis, titled "Short Nights of the Shadow Catcher," written by Timothy Egan. Curtis devoted his life to documenting and photographing the native American Indian population before they were assimilated into the Anglo-European white majority. It was also a milestone for me since it was my 200th biography read since February 2010. We had an unbelievable day today in the Mojave Desert. Sand dunes, a volcano and a couple of iconic buildings rounded out our adventure. For pictures, click here. Our good friend Maxine is visiting us and we took her to see The Huntington today in San Marino, CA. For pictures, click here. Today we enjoyed the warm temperature by having a couple of lobsters for lunch, poolside, with a nice 2006 bottle of Orvieto wine. The pleasures of winter in SoCal! We enjoyed a beautiful California day in downtown Los Angeles today. We saw a museum, visited a library and saw so many piñatas that we didn't even try to count them. For pictures, click here. 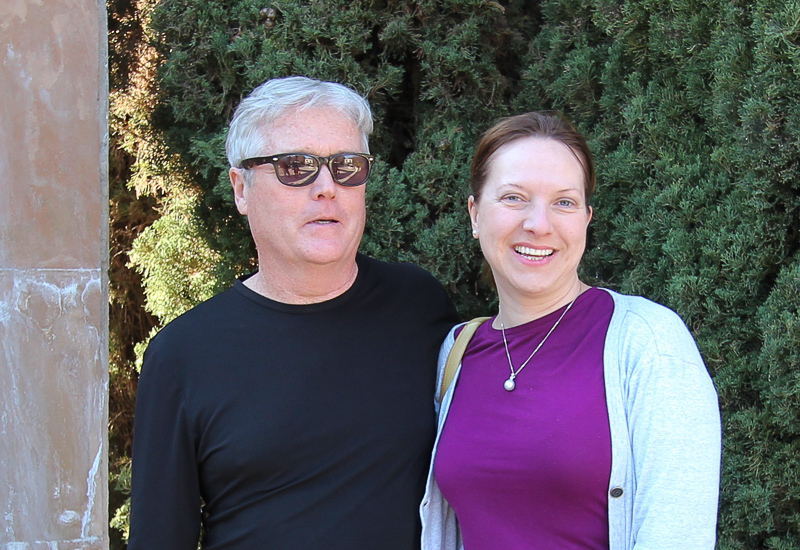 Today we had a great time visiting with Olga and Mark Farrell, whom we hadn't seen for two years. They live in New Hampshire and Mark is attending a medical conference in San Diego. We met them at the Coyote Grill in Laguna Beach for lunch. Everyone enjoyed their meal. Afterwards we poked around downtown Laguna Beach and stumbled upon a sculpture garden, where this picture was taken. Before we hooked up with them, we had driven down to Doheny State Beach in Dana Point. 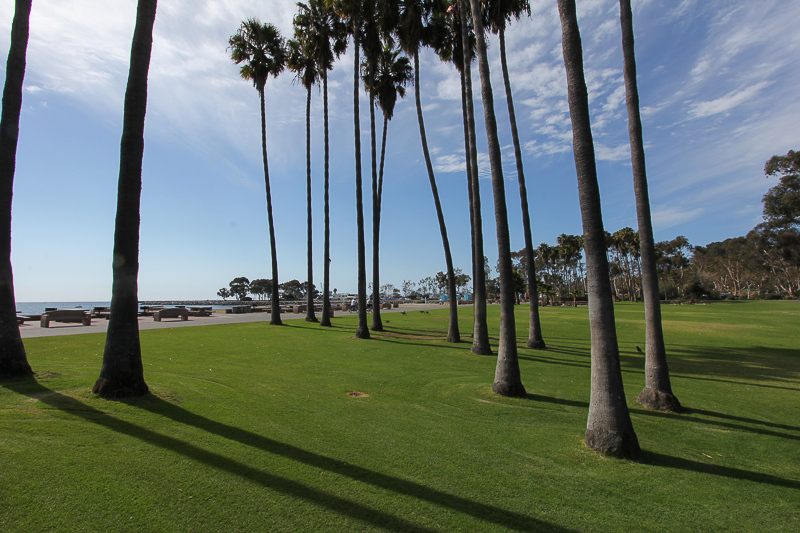 If this is the way to suffer through winter in Southern California, we'll take it. Today we enjoyed a wonderful, two-hour tour of the Paramount Picture Studios in Hollywood. To see some pictures of Paramount, click here. "Upon my retirement four years ago, I've decided to only read biographies and I'm currently up to the M's. When I saw your book, my first impression was to pass on it since I felt that I knew everything I needed to know about Marilyn Monroe. However, after picking it up and reading it, I realized that I knew nothing! What a fantastic biography you have written, well done!" "Thank you, sir. Really appreciate that. We are doing it as a four hour miniseries for TV right now. You can check my website, below, for updates when we start announcing the network etc...... Thanks for this lovely note. JRT"
His web site is www.JRandyTaraborrelli.com and I'm looking forward to the miniseries! This book is a great read. The heat and the drought continue. It's hard to believe that it's winter in Redlands. Here are our recent high and low temperatures for the last 36 days. Today we drove over to Newhall, CA to see the William S. Hart Ranch and Museum. Hart was the first cowboy movie star during the silent film era. To see some pictures of his 10,000 square foot mansion, click here. Yesterday we took a short ride over to the former Norton Air Force Base in San Bernardino. Amazon now operates a distribution center there, which they call a "fulfillment center." The two industrial buildings at the site occupy approximately one million square feet. There hasn't been any information on the Internet about touring the facility, so we figured we go there and find out for ourselves. Unfortunately, we found that there aren't any tours available and that the two buildings are like armed fortresses. Steel gated turnstiles are what greets visitors at the main entrance and you need an electronic ID card to gain access. We were able to look in to see a very high tech operation behind the steel gates. It's no wonder that we receive our Amazon orders so quickly after purchasing them on line. It had been six months since we had brunch at Le Rendez-Vous Restaurant in San Bernardino, so we went yesterday. It's a real treat, but we'll have to take a long walk today to work off those calories.